Summary: This article describes the Denver Writing Project’s three-year professional development model used in partnership with several local schools/districts. In the first year, the site builds local capacity through teacher study groups, then transitions in the second year to site-sponsored professional development related to the topics researched by the study groups during the first year. The third year of the partnership is dictated by local school needs, with some schools starting new teacher study groups and some continuing with professional development through demonstration lessons or other means. Those starting new partnerships would be well-served to explore the document in its entirety, but a specific focus on setting and making explicit the goals for the program (p.2) and the expectations of participants and facilitators (p.2-3) may be especially useful. 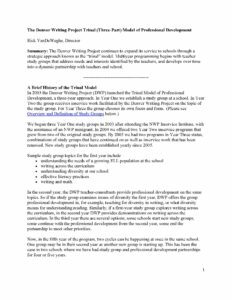 We began three Year One study groups in 2003 after attending the NWP Inservice Institute, with the assistance of an NWP minigrant. In 2004 we offered two Year Two inservice programs that grew from two of the original study groups. By 2005 we had two programs in Year Three status, combinations of study groups that have continued on as well as inservice work that has been renewed. New study groups have been established yearly since 2005. In the second year, the DWP teacher-consultants provide professional development on the same topics. So if the study group examines issues of diversity the first year, DWP offers the group professional development in, for example, teaching for diversity in writing, or what diversity means for understanding reading. Similarly, if a first-year study group explores writing across the curriculum, in the second year DWP provides demonstrations on writing across the curriculum. In the third year there are several options; some schools start new study groups, some continue with the professional development from the second year, some end the partnership to meet other priorities. Now, in the fifth year of the program, two cycles can be happening at once in the same school. One group may be in their second year as another new group is starting up. This has been the case in two schools where we have had study group and professional development partnerships for four or five years.